Deep in the recesses of a basement at a former meatpacking facility in Back of the Yards, opposite large hydroponic tanks and industrial storage lockers, lives an unlikely success story. Tiny shoots of pea, radish, and peppercress bask under hanging lights, housed on several racks six feet tall and eight feet long. Twice a week, they are harvested and delivered to restaurants throughout the city, where they introduce surprisingly strong flavors into salads and sandwiches. Meanwhile, the leftover soil is composted, and a new set of trays, filled with germinated seeds, is brought out from underneath and into the light. 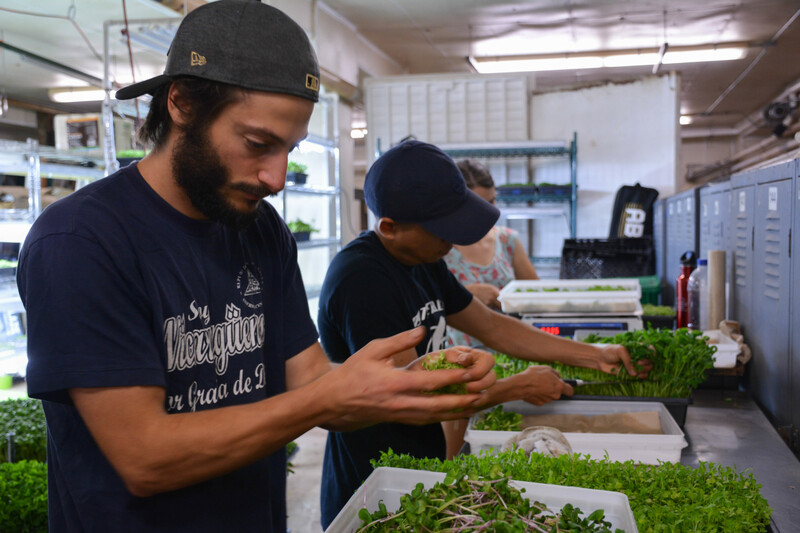 The cycle continues and the demand for microgreens grows. Adam Pollack, founder and head farmer of Closed Loop Farms, the basement microgreens farm, thinks this is only the beginning of his sustainable foods project. He’s come a long way in the past year: from growing microgreens in his apartment and selling them to a few restaurants, he’s moved to a dedicated space at The Plant, a sustainable food business incubator, with over thirty-five regular customers and several part-time employees. Most weeks, he delivers the equivalent of 150 trays. At this rate, he speculates he may have over sixty customers by next summer. Pollack came to urban agriculture from a different wing of the food industry—the restaurant scene. Originally from Highland Park, Pollack left the University of Texas in 2011 and ended up at notable, high-end restaurants in Chicago like Avec, the “rustic Mediterranean shared-plates” restaurant in the West Loop; Publican Quality Meats; and Rick Bayless’ Topolobampo. While still a cook, he became preoccupied with finding ways to reduce waste in the food production chain. Even in the food industry, where tight profit margins might seem like incentive enough to minimize waste, he saw it almost everywhere. Bakeries threw out bread at the end of the day, containers in which food was delivered were discarded instead of reused, and unneeded but edible parts of vegetables and other products were composted—better than tossing them in the trash, but still not an efficient use of resources. He began to think about strategies for tackling waste in the food system at the broader level, and tying these ideas to a project of building greater food resiliency and sustainability throughout Chicago. One way was to do it through canning, which repurposes excess food into sauces and spreads. “You can only grow food for eight months out of the year max, so canning and fermenting is totally crucial,” he says. Pollack began experimenting. In one restaurant, where watermelon radishes were hole-punched into small circles for a dish and the leftover radish was composted, he made kimchi out of a week’s worth of scraps—it lasted him over a year. Looking for inspiration, he took a permaculture design course in Nicaragua and came back motivated to start his own farm. It didn’t matter to him whether he would be on an outdoor urban farm or in his apartment, so long as he was growing food of some kind. Using his savings, he started his business, Closed Loop Farm, last year, and at the same time launched a temporary community garden in Humboldt Park and began growing microgreens in his apartment. Pollack wanted to incorporate canning and zero-waste practices into his business. “If you want to talk about building resilient, local food systems, you need to talk about canning,” he says. So Pollack started buying excess and less-than-perfect produce from vendors at farmer’s markets at a discounted rate to make pickles and sauces. With a friend, he made between 500 and 600 cans just in their kitchen. The microgreens have since taken over—there were lower startup costs and demand was surprisingly high. “Microgreens are a good urban farm business because they grow so quickly that you can increase or decrease production as demand changes,” he explains, noting that fast turnaround time also means that there are more learning opportunities to make small adjustments and conduct experiments. Pollack hopes to have more time for canning one day, but in the meantime, he’s focusing on teaching the craft. Just last weekend, he taught a workshop on canning and preserving foods at The Plant in which participants could go home with kimchi they had made and a basic understanding of how to make the Korean fermented dish. In that respect, Closed Loop Farms is the perfect fit for The Plant, which in addition to housing other food businesses, is home to Plant Chicago. Established as a nonprofit in 2011, Plant Chicago conducts research about closed-loop energy and food production practices, and implements best practices in its Back of the Yards home. Its programming has contributed tangibly to the network of sustainability-oriented food businesses, and is increasingly looking toward a bigger scale. Earlier this summer, two researchers from Loyola University worked with Plant Chicago to publish a paper on how to move Chicago toward a circular economy. When Pollack was looking for a space for his microgreens last year, The Plant’s owners, Bubbly Dynamics LLC, offered him as much space as he needed, and at low cost. Pollack’s proximity to other farmers at The Plant and Plant Chicago’s access to networks of volunteers, staff, and researchers in sustainable food systems proved to be a boon as well. Pollack received many of his lights—one of the most expensive elements of the operation—at a heavy discount from another farmer who was leaving The Plant and needed to get rid of his stock. He crossed paths with some of his current part-time employees at The Plant—Pollack met Jose Popoca and Jake Rubinstein his two current heads of production, for instance, after meeting them at The Plant and through a Plant Chicago email listhost, respectively—and being able to advertise his workshops through Plant Chicago’s website has proved effective as well; last week’s kimchi workshop was sold out at least several days ahead of time. As the name of his company suggests, Pollack believes part of the effort in moving toward food sustainability and resiliency necessarily involves transitioning into a circular food economy, in which as many of the resources involved in food production—soil, excess supply, and even containers—are recycled back into local economies through composting, canning, and reuse. “That’s the loftier goal [for Closed Loop Farms],” he says. Part of Pollack’s vision for what urban agriculture can do was formed by his experience with a short-term community garden he built up in Humboldt Park last year. He worked out an arrangement with LUCHA, a housing advocacy group in Humboldt Park that was trying to implement more wellness initiatives with their tenants. In exchange for access to land near a low-income housing project that was to be developed that year anyway, Pollack assumed all the costs of working the land: soil, seeds, water, and labor. The garden was also open to participation from housing project tenants as well as other locals. “We were doing things by the seat of [our] pants,” Pollack says. “We were growing and figuring out ways to structure as we were doing it.” He arranged to pay a neighbor in exchange for their water hose and estimates that there were about ten people—and five core members—who regularly contributed labor and took food home. Drawing on his experience with the community garden, Pollack imagined a scenario in which every ward or neighborhood in the city had its own collaborative farm, with some even including a greenhouse for all-year growing. “Each one can self-organize and see how they want to do it,” he says. “Pay for labor, or don’t pay for labor and all the food goes back to the laborers.” Moving beyond the model of small, individual community gardens, which are plentiful in Chicago but can’t hope to provide serious sustenance for a community, a system like that could possibly make a real dent in the food deserts of the West and South Sides. And tasty and nutritious as they may be, microgreens are not a feasible substitute for vegetables and other foods with more nutritional value. At best, they make for a good accessory to an existing assortment of healthy produce—precisely the kind of food inaccessible to people who can’t afford it in stores and don’t have the time, experience, or land to grow their own food. 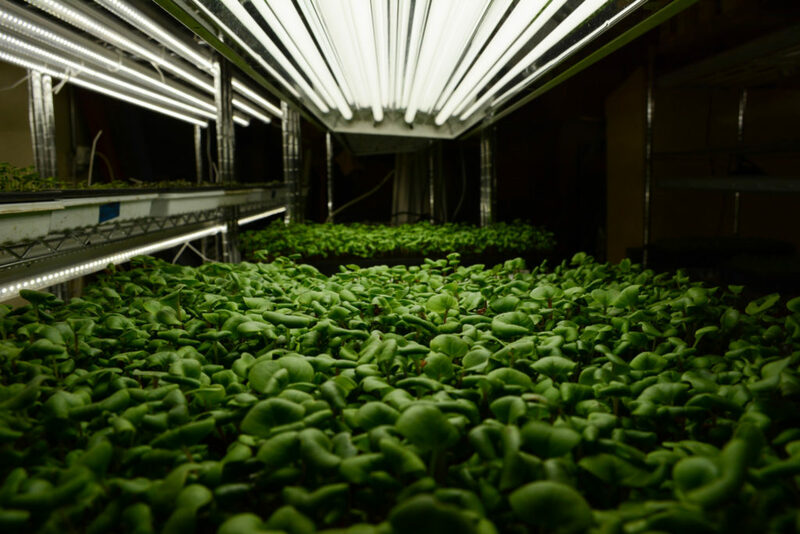 At the same time, Pollack sees accessibility in microgreens in an urban setting. “Microgreens have a good potential…for [people] to be growing them in their own homes,” he explained. Low startup costs (a few trays, some soil, and seeds), relatively easy care, and fast turnaround (around two weeks between planting and harvesting) are factors in favor of people short on time, money, and experience. Earlier this year, Pollack hosted a workshop at The Plant in which he explained how to grow microgreens and even demonstrated how to plant a tray for optimal growth. He sells microgreens at The Plant’s farmer’s market and occasionally sells bulk amounts at discounted rates to local stores and markets. Correction 11/10/17: A previous version of this story conflated The Plant, the building, with Plant Chicago, a nonprofit housed in The Plant. They are individual entities.